We are sad to announce we are canceling today's activities and the Farm will be closed due to continued rain, cold and poor ground conditions. After several days of rain the grounds are now flooded in areas, including the egg hunting field. "Breakfast with the Easter Bunny" will be rescheduled for next week as planned in your ticket purchase terms. Friday's breakfast has been rescheduled for Friday, April 26. Saturday's breakfast has been rescheduled for Saturday, April 27. If for some reason you are unable to attend your makeup date as defined in your ticket purchase terms, then please email us at fun@luckyladdfarms.com to request a farm credit which may be used towards future admissions, concessions and gift shop purchases. "Perfect Easter celebration! Delicious breakfast and tons to do. "Marta P.
Put some spring in your step and magic in your child's Easter holiday during our breakfast with the Easter Bunny. 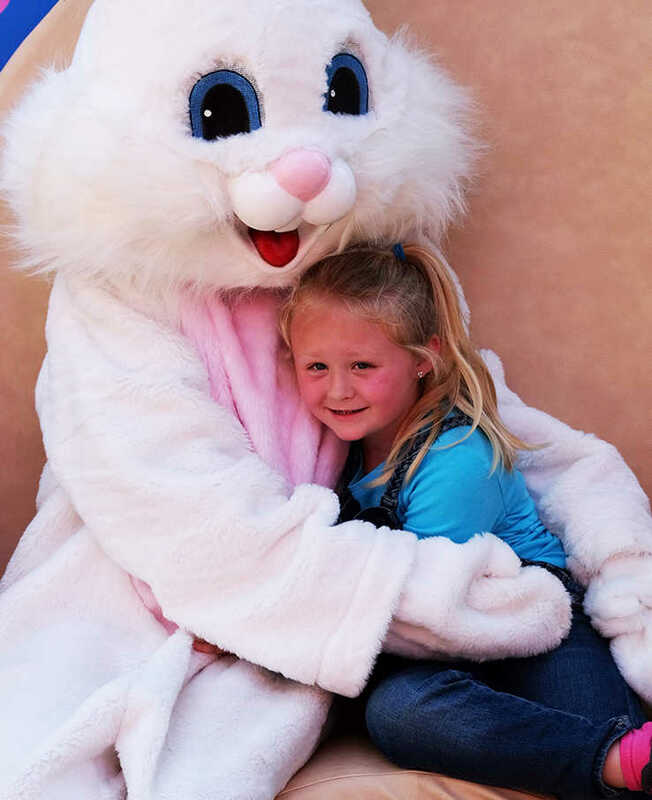 This special VIP breakfast includes a scrumptious breakfast buffet, table-side meet-n-greets with the Easter Bunny, a visit with some of the Farm’s favorite baby animal ambassadors, craft station and souvenir gift for each child. Beat the crowds - It’s a fun way to start your day before hopping along to our Spring Easter Festival celebration and eggs hunts at Lucky Ladd Farms. Reserve tickets early, limited seating available! Registration ends April 12. Our scrumptious hot breakfast buffet features pancakes with Lucky Ladd Farms own gourmet syrups and toppings, bacon, sausage, scrambled eggs, seasonal fruit, pastries, muffins, hot chocolate, juice and water. Breakfast buffet closes at 10:30 AM. Advanced Registration Required. Limited Seating Available. Pricing includes breakfast buffet and Farm admission with each ticket; plus Easter souvenir and craft for each registered child. All sales are final. Weather-related cancellations made by 7:30 am on date of event. In event of weather-related cancellation, breakfast will be rescheduled for the following week. Designated makeup dates are 4/26 for Friday seatings and 4/27 for Saturday seatings.